It may be almost a decade since his last World Championship, but Fernando Alonso has, throughout that time, retained a steady reputation as arguably the finest driver on the Formula One grid. His 32 career victories place him 5th on the all-time winners list, an impressive tally that illustrates the enduring consistency of a man whose career lacks even a single season of epochal dominance. Alonso hasn't been blessed with the fastest car in the field since 2007, yet has been a race-winner in every season since with the exception of 2009, consistently hauling indifferent machinery into chequered flag contention. The statistics may crown Sebastian Vettel as the undisputed king of the post-Schumacher era, but it is Alonso's sense of indefatigable hustle and his ability to extract the absolute maximum from almost any on-track scenario which has equally indelibly defined the past decade. Unsurprisingly, for a man whose career has been characterised by outperforming fallible machinery and titanic title showdowns, there are a catalogue of classic Alonso performances in the archives - and the races detailed below are just six of the many occasions that Alonso has consecrated his reputation as arguably the cream of F1's current crop. 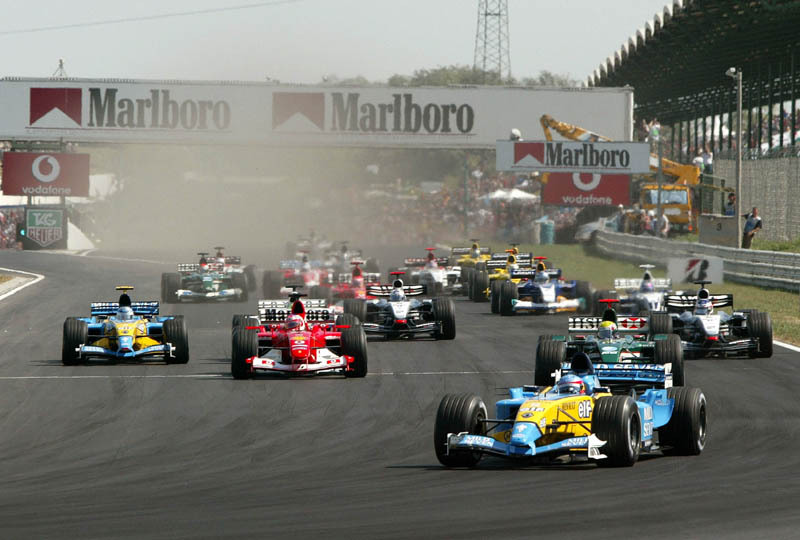 Fernando Alonso's first victory remains one of his very finest, a tour-de-force of dominance around the Hungaroring which extracted the absolute maximum from a perfect alignment of the high-downforce Renault R23 and the enduring warm-weather performance of that season's Michelin tyres. Alonso's maiden win, at the 30th attempt, was no bolt from the blue - the Spaniard's star quality had been evident ever since he outqualified team-mate Tarso Marques by 2.6 seconds on his debut for Minardi in 2001. Alonso was promoted to the Renault race team at Jenson Button's expense for 2003 and immediately demonstrated his pace - taking pole in only his second race in competitive machinery at the Malaysian GP. Interestingly, the pole position was one of several 'youngest' records Alonso held prior to Sebastian Vettel's ascendance, with Alonso at one time holding records for youngest pole-sitter, race winner, hat-trick (pole, win, fastest lap), World Champion and double-World Champion - all accolades subsequently claimed by Vettel. Alonso's maiden victory announced his arrival at the top table of Formula One, and unlike many an inherited or lucky first win was a consummate demolition of the field. Starting from pole, Alonso quickly built a huge lead, heading the field by a stunning 21 seconds after only 13 laps. The race didn't feature a stirring battle for the lead, but what marks the performance as so special was the way in which Alonso, with very limited experience of running at the front of Grands Prix, was able to dominate his vastly more experienced rivals without displaying any external signs of pressure - coasting to take the flag by 17 seconds from Kimi R?ikk?nen. As has been a recurring feature of Alonso's career, his team-mate was nowhere. Jarno Trulli was outqualified by a second and finished a lapped seventh, impotently dwarfed by the standards of the Spaniard's performance. The final hurrah for Alonso came when he lapped championship leader Michael Schumacher - laying the first marker for the young pretender's assault on the Ringmaster's crown. If Alonso's first victory demonstrated his capacity to control a race from the front, his fourth, at Imola in 2005, highlighted another trademark Alonso trait - the ability to withstand intense on-track pressure. 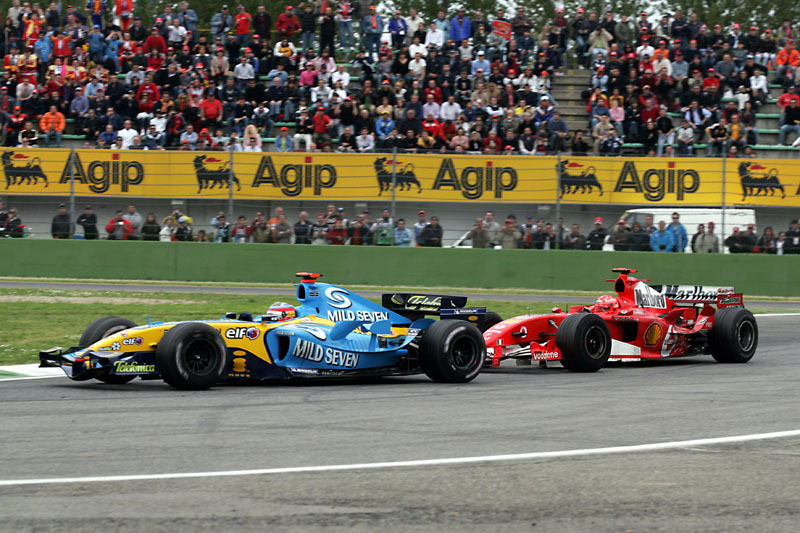 At the start of the 2005 season, a significant swing in performance between the Renault and Ferrari teams gave Alonso a chance to relinquish five-time reigning champion Michael Schumacher's iron grip on Formula One. A lightning start to the year saw Alonso take a third place in Australia followed by back-to-back victories in Malaysia and Bahrain to establish a healthy lead in the standings. Schumacher by contrast had scored just two points in the opening three races, and the champion was in the unusual position of playing catch-up. The race was a slow-burner, with Alonso starting second behind Kimi R?ikk?nen's McLaren, and Schumacher a lowly 13th on the grid following a mistake in qualifying. Once R?ikk?nen retired from the lead on lap nine, Alonso looked on course for a comfortable victory to complete his hat-trick. Schumacher though had other ideas, hauling his way into contention through a trademark series of strategically timed pit stops and fast laps in clear air. After passing Jenson Button for second place and making his final pit stop, Schumacher emerged on Alonso's tail with 13 laps to go. What followed was the most nail-biting demonstration of defensive prowess since Monaco '92, as Alonso and a much faster Schumacher circulated nose to tail for the final ten laps. The young apprentice positioned his car perfectly to keep the veteran master at bay, deliberately slowing in the tight corners to give himself a traction advantage, and kept his composure as Schumacher danced around in his wheeltracks, taking unorthodox lines in an attempt to spook Alonso into a mistake. Alonso didn't blink, and his brilliant victory marked a true changing of the guard moment. Ferrari's San Marino renaissance proved a scarlet herring as the Schumacher challenge foundered, while Alonso used the early-season victories as a springboard to claim his maiden title - ending the oppressive drudgery of Schumacher's five-year reign and ushering in a brave new era for Formula One. The N?rburgring GP-Strecke is a pale imitation of the original Nordschleife, but the rapidly variable weather of the Eifel Mountains has nevertheless contributed to many a classic race - although perhaps none can top the drama of Alonso's victory at the 2007 European GP. Set against the political context of the looming 'Spygate' hearing, and the sporting backdrop of rookie team-mate Lewis Hamilton's 12-point lead over Alonso in the championship standings, the Spaniard was certainly under pressure ahead of the race. An accident for Hamilton in qualifying put the Briton back in 10th, and Alonso lined up on the front row alongside Kimi R?ikk?nen's Ferrari sensing an opportunity to eat into the Briton's championship advantage. However, a biblical deluge on the opening lap caused chaos, with torrentially changing conditions seeing five cars aquaplane into retirement at Turn One alone before the race was eventually red-flagged. Alonso took the restart third behind Felipe Massa's Ferrari and debutant Markus Winkelhock, benefitting from an inspired tyre choice from the Spyker team. Of more significance for Alonso was the fact that Hamilton was a lap down after a puncture and a spin - giving the Spaniard an open door to whittle the championship lead down to just two points with a victory. 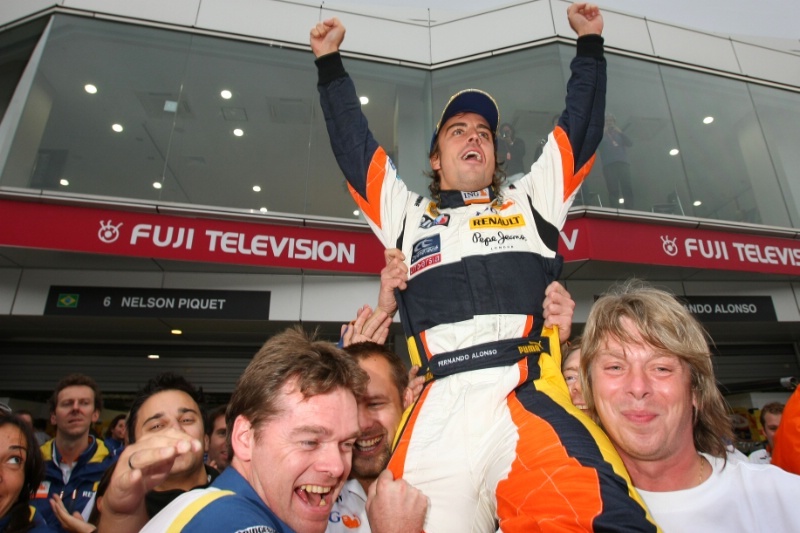 After dispensing with Winkelhock, Massa led Alonso comfortably for virtually the entire race distance on a dry track, before a shower ten laps from home changed the complexion of the race again. Massa and Alonso pitted for intermediates, and the McLaren wiped out the Ferrari's five second lead with ease as they returned to the track in increasingly greasy conditions. Six laps from the end, Alonso was right with Massa exiting the first corner, and the two snaked their way through the sodden stadium section side by side - but the Ferrari held on. A lap later, championship challenge on the line, Alonso took a slingshot run around the outside of Massa at turn six, spectacularly banging wheels and forcing his way into the lead. 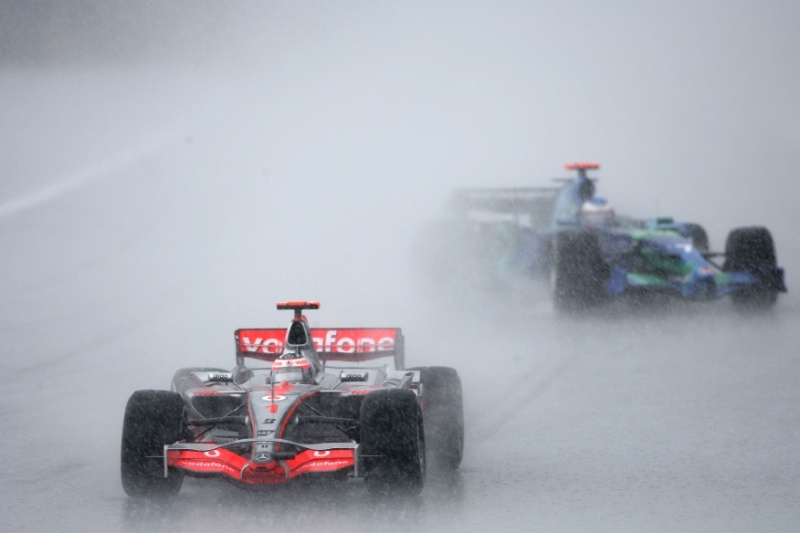 Massa had no answer, and Alonso powered to the chequered flag to take his first wet weather victory. It would be a rare high point in a miserable campaign for Alonso, who would reach his personal nadir at the very next race in Hungary. Alonso returned to Renault for 2008, tail between his legs and reputation somewhat sullied by the nuclear fallout of his sole season at McLaren. Renault though were nowhere near the force they had been when Alonso left in 2006, and the two-time champion didn't reach the podium until his victory at the infamous 'crashgate' Singapore Grand Prix. Contentious as it was, the win was a catalyst for a late-season Indian summer for Alonso, and he followed up the victory in Singapore with an equally unexpected win at Japan's Fuji Speedway. Starting fourth, Alonso's passage to victory was eased by early incidents for the hitherto dominant McLaren and Ferrari cars. Into the first corner, polesitter Lewis Hamilton locked up massively, forcing team-mate Heikki Kovalianen and Kimi R?ikk?nen's Ferrari to take avoiding action. Robert Kubica's BMW slipped into the lead, with Alonso in hot pursuit. A collision between title protagonists Hamilton and Felipe Massa reduced the threat from behind, although the recovering Kovalainen and R?ikk?nen in faster cars certainly had the pace to challenge Alonso and Kubica. Having kept Kubica in his sights in the opening stint, Alonso jumped the Pole during the first round of stops, and subsequently set a searing pace to escape the BMW and open up a gap of 12 seconds during the second stint. With Kovalainen retiring and R?ikk?nen's fightback held up in a classic duel with Kubica, Alonso's run to the flag was relatively unchallenged, and he duly took his second consecutive win by five seconds. In the context of a season in which Renault had been feeding off scraps, it was a welcome demonstration of genuine speed and the classic Alonso trait of fully capitalising on his rivals' misfortune given even the merest sniff of a race victory. Two World Championships may not be an appropriate return for a driver of Alonso's talent, but three outright second places and a third place championship finish one point behind the title winner indicate his enduring consistency and ability to remain in contention across a range of circumstances. If 2007 was the one that got away, then 2010 and 2012 would see him haul the third fastest (at best) car on the grid to a title showdown through a combination of blinding first laps, intelligent race management, unrelenting determination and phenomenal consistency. Nothing indicates this pure pace deficit more than the fact that Alonso has qualified on pole only four times in over four seasons with Ferrari. The first two of these came in the midst of the titanic five-way 2010 title battle, as Alonso stepped up to assert himself on the fluctuating championship struggle as the season reached its business end. A pole-to-flag victory at Monza put Alonso third in the championship, but with a 21 point deficit to Mark Webber. The following race, at Singapore, looked tailor made for Red Bull to check Alonso's momentum. Between them, Webber and Sebastian Vettel had won at high downforce circuits in Spain, Monaco, Valencia and Hungary - and the Marina Bay Circuit was prime RB6 territory. Alonso though had other ideas. Starting from an unexpected pole alongside Vettel, Alonso rudely chopped the fast-starting Red Bull into turn one, and led every lap of the race for his first career Grand Chelem victory. If that sounds rather mundane for a classic victory, consider that Alonso was under intense pressure from Vettel for the duration of the race. Through safety car periods, pit stops, traffic, brake issues, rivals tripping over each other and Heikki Kovalainen's remarkable pit straight fire, the gap between the two was never more than three seconds, and frequently much less. Alonso had little right to wrestle a performance of such magnitude out of either himself or the Ferrari, yet he found another level that day. Alonso and Vettel would share the last six race victories of the season between them, conducting the crucial stages of the title chase to their own tune. 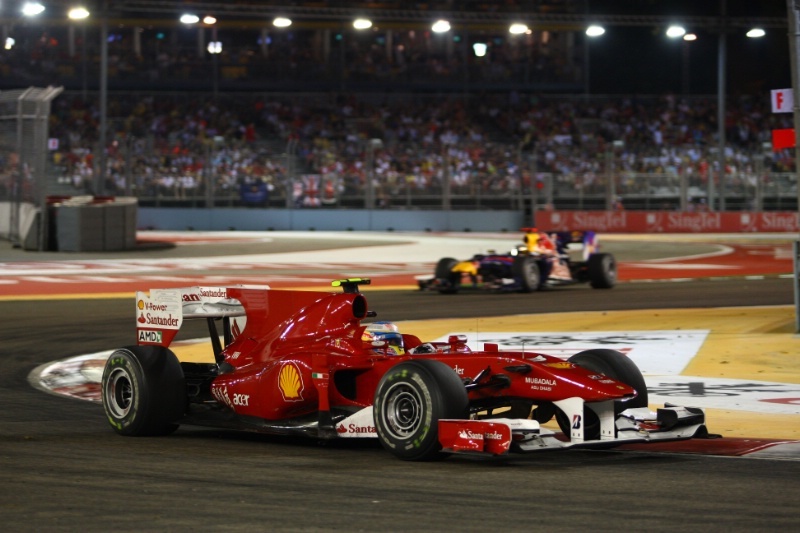 Ultimately Vettel snatched the title by just four points, but Alonso's performance in Singapore showed he would have been an equally deserving championship victor. If 2010 was a year in which Alonso transcended the performance level of his Ferrari to stay in the championship hunt, in 2012 the Spaniard went one better and put together one of the greatest seasons in Formula One history - yet he was again denied the title by Sebastian Vettel at the very last. Throughout the campaign Alonso brilliantly maximised every opportunity, and despite starting the year with barely the fourth fastest car, by mid-season he held a commanding lead in the standings through sheer point-scoring consistency. A fluctuating start to the campaign saw seven different winners from the opening seven races, and Alonso became the first double victor with a sensational charge to win from 11th on the grid at the Valencia street circuit. Alonso's trademark fast start was the catalyst for his climb through the field, moving up from 11th to eighth on the opening lap, before passing Nico Hulkenberg, Pastor Maldonado and Kamui Kobayashi ahead of the first pit stops. Emerging from the pits into a traffic jam, Alonso rapidly dispatched the late stoppers (including a thrilling pass on Mark Webber), putting the Ferrari in fourth place and prime position to capitalise on any misfortune for the leaders. 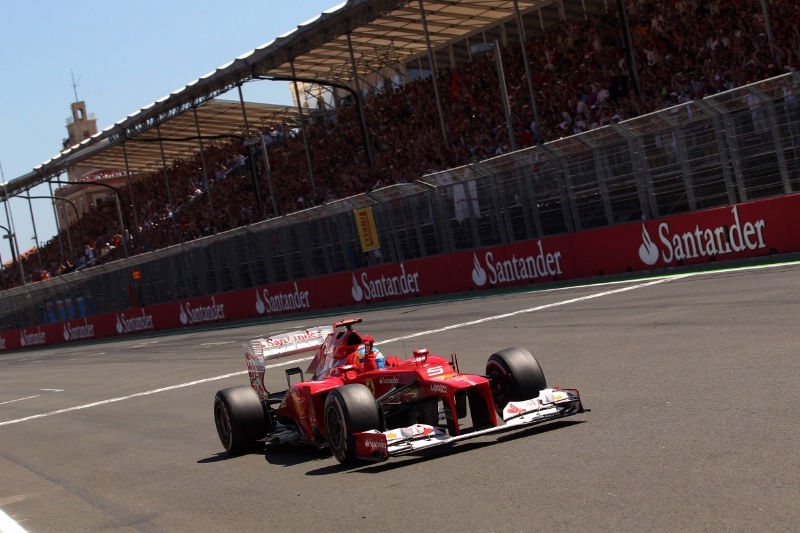 A series of events at the midway point turned the race emphatically in Alonso's favour. First, a safety car for debris on the track eliminated the huge lead that Sebastian Vettel had built up from Romain Grosjean, Lewis Hamilton and Alonso. As the quartet dived into the pits, a front jack problem for Hamilton promoted Alonso to third. At the restart, Alonso outdragged Grosjean, expertly dispatching the Lotus around the outside of Turn 1. Then, incredibly, Vettel's alternator failed on the very same lap, promoting Alonso to first place. The threat to Alonso diminished when Grosjean also retired with an alternator problem, and the Spaniard cruised to take a highly emotional home win - reclaiming the championship lead in the process. As so often in Alonso's career, he was able to capitalise to the absolute maximum and pick up the pieces as bad luck befell his rivals. Fortune undoubtedly played a part, but in passing so many cars and putting himself in a position to take the victory, Alonso arguably, as so often, made his own luck.